Blizzard’s mash-up MOBA Heroes of the Storm, is getting its first ever Warcraft event, in the form of Echoes of Alterac. Launching alongside a mass of other HotS additions from Blizzard’s fantasy setting, this event will bring a horde of Warcraft-y goodies to the game, across all maps and game modes. New cosmetic items on their way to Heroes include a host of sprays, portraits, skins and more. However, what’s perhaps most interesting about this update, is the branching quest lines on their way to the Nexus. When the event kicks off, players must choose a side in the epic conflict of Azeroth – Alliance or Horde. You can then earn unique rewards specific to the path you have chosen, including a Ram mount for horde and Wolf mount for Alliance. Become a hero of a different storm with our definitive list of the best MOBAs. You will also be rewarded for embracing the Warcraft spirit and playing one of the existing Warcraft heroes. Play four games as your chosen Warcraft warrior and you will unlock a free Warcraft hero, pulled a random from the pool of 28. Has your result got you wanting to slay an orc? Cash in some of your gold for a reroll. Achieve 50 tickdowns to get unique Ram or Wolf portrait. Play six games with friends and nab some new Warcraft-themed banners. To ride into the battle in style, win eight games a Warcraft hero to score those new mounts. Finally, you can kit out your favourite heroes from any universe with some all-new Alliance and Horde skins. Our personal favourite was one that turns Junkrat into a gun-toting orc. 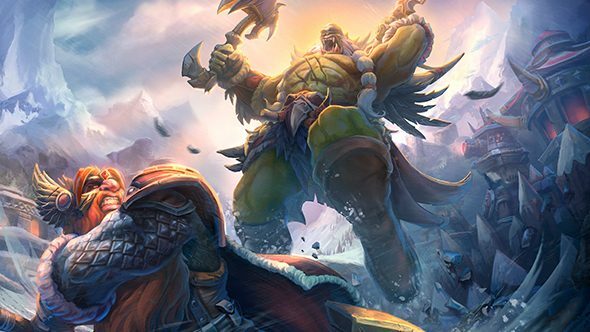 You’ll see further Warcraft-themed additions to HotS in the form of the new map Alterac Pass and hero Yrel in this update, which are set for an unspecified date this summer. The precise launch date for those additions and the Echoes of Alterac event is still to be confirmed.